Dr. Joel Joseph S. Marciano, DOST-ASTI’s Acting Director, talks about his visions for the agency this 2019. 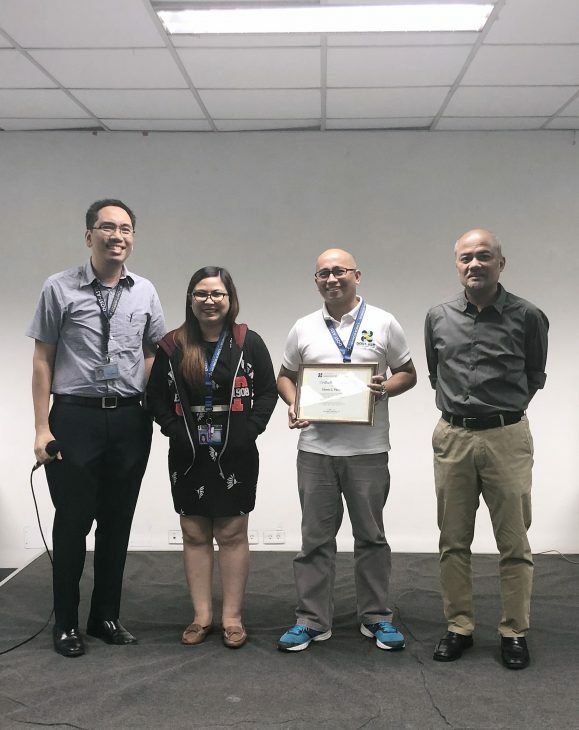 The Department of Science and Technology – Advanced Science and Technology Institute’s (DOST-ASTI) Office of the Director hosted the first Kapihan of the year on 14 January 2019 at the DOST-ASTI building in Diliman, Quezon City. 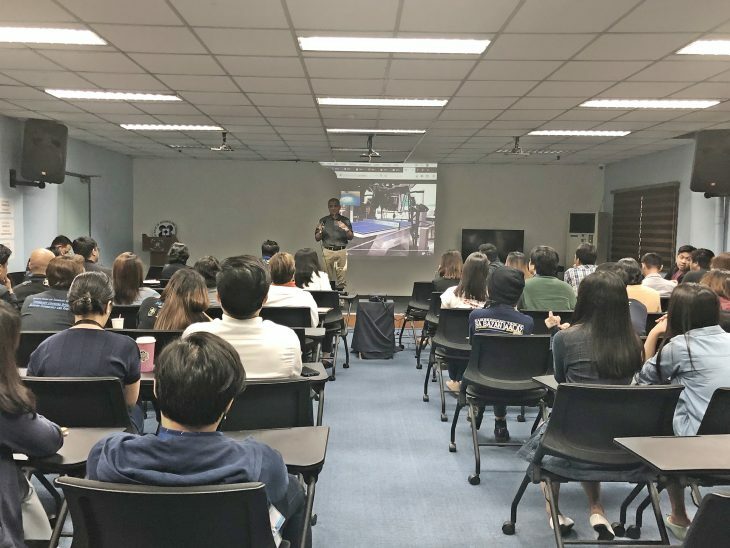 Kapihan was the agency’s monthly assembly, which serves as a venue for knowledge sharing sessions, research and development (R&D) project updates, and announcements. Since it was the first Kapihan of 2019, the OD included the discussion of all divisions’ 2018 accomplishments and 2019 plans as well as the establishment of new units. Ms. Norhayla S. Magandia explains 2nd phase of the EPDC project. The first division to present was the Research and Development Division (RDD). 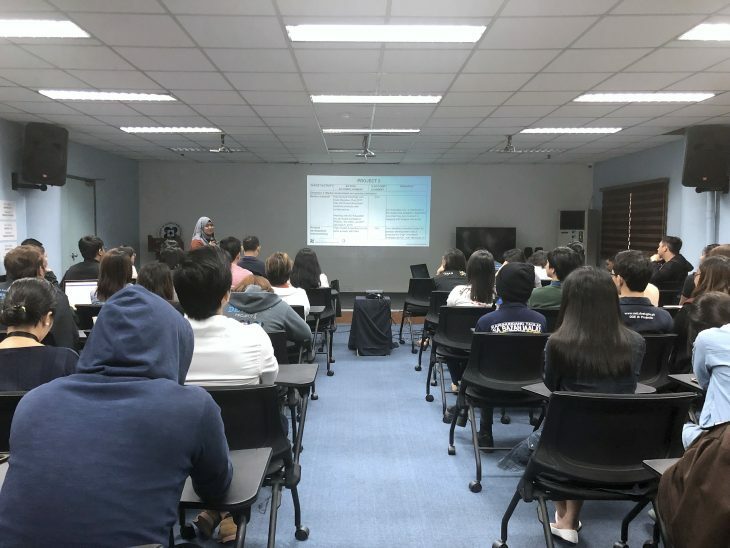 Ms. Norhayla S. Magandia, Program Manager, talked about the Electronics Product Development Center (EPDC) Inclusive Innovation Center (EPIIC). 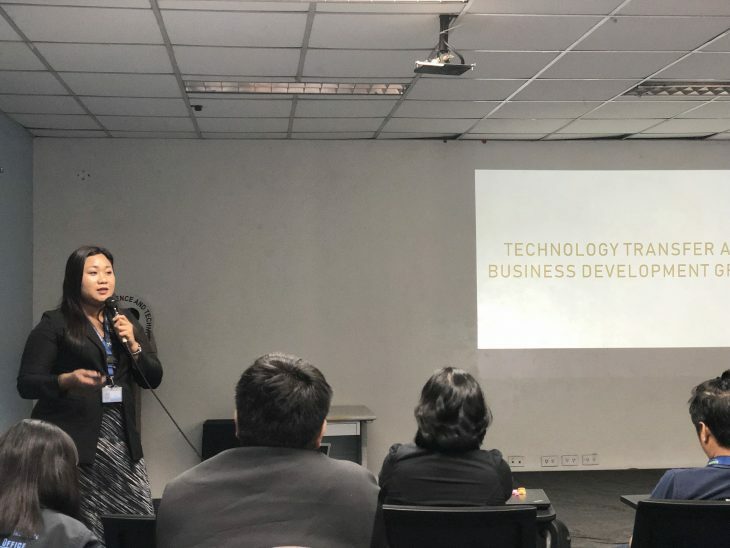 The overall goal of this R&D project was to help expand the Philippine electronics industry from assembly and testing to development of new and innovative world-class products, which would be marketed by the Department of Trade and Industry (DTI). 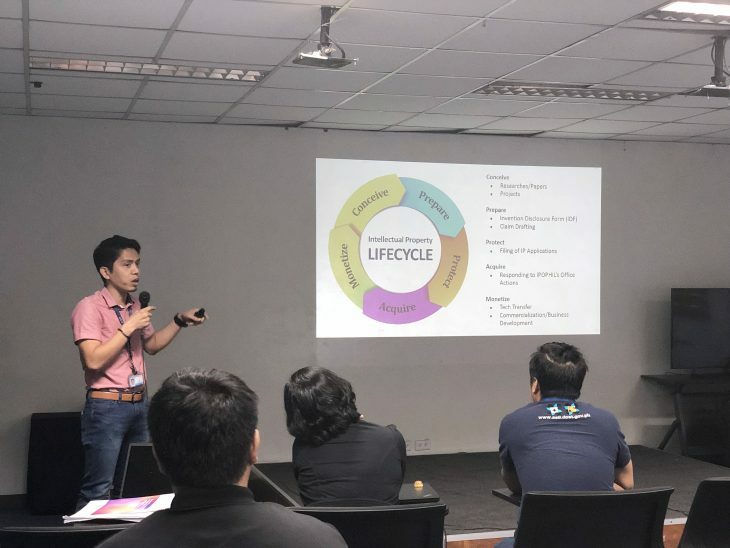 The EPIIC project, which was the first inclusive innovation center of the DOST, commenced on March 2018 and was expected to be completed on February 2020. Other R&D projects not discussed but were also under the RDD included the Remote Sensing and Data Science (DATOS) Help Desk and the Computing and Archiving Research Environment (CoARE). 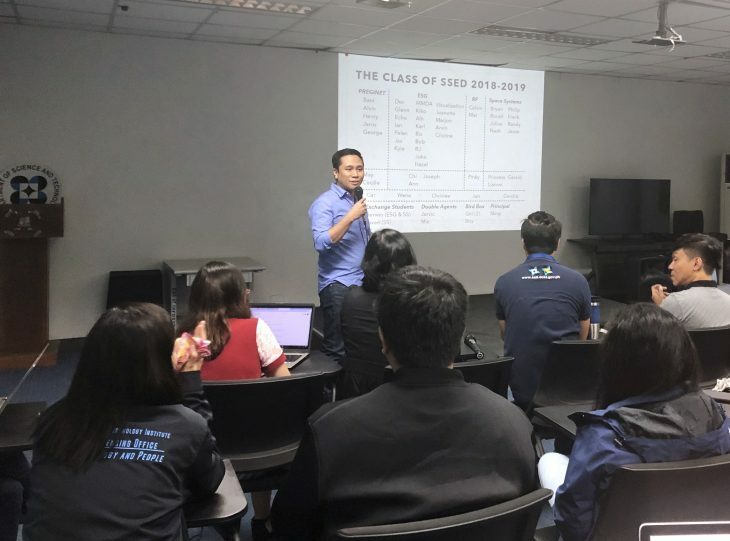 Solutions and Services Engineering Chief Alvin E. Retamar enumerated the teams handling the division’s R&D projects: PREGINET team, ESG, PEDRO team, and Space Systems team. With “Services” as its middle name, the Solutions and Services Engineering Division (SSED) proudly shared its service contributions to some of the momentous events in 2018. Mr. Alvin E. Retamar, SSED Chief, discussed that the division managed to: take part in the launching of DIWATA-2 and MAYA-1, consolidate 26,000 images through the Philippine Earth Data Resource Observation (PEDRO) Center, and provide 10 gigabytes of stable connectivity through Philippine Research , Education and Government Information Network (PREGINET). SSED also oversaw the completion of another ground receiving station (GRS) in Davao, which was installed with a 7.3-meter antenna. The GRS was expected to be operational this 2019. The importance of data from various hydrometeorological (hydromet) stations and images from PEDRO during typhoons was also highlighted in the presentation. Other R&D works of SSED discussed were: Understanding Lightning and Thunderstorms Project (ULAT), Connecting Communities through Mobile Networks (CocoMonets), Spectrum monitoring, Software Defined Radio (SDR) Telemetry/Telecommand (TM/TC), Optimization of satellite images with DOST-Philippine Atmospheric, Geophysical and Astronomical Services Administration (DOST-PAGASA), Bureau of Soils and Water Management (BSWM) project, and product development of Advanced Remote Data Acquisition (arQ) datalogger unit. For 2019, the SSED aimed to continue the operations of its major R&D projects along with all its R&D works. Mr. Retamar also mentioned some of the new ventures for the division like the Ground Receiving, Archiving, Science Product Development and Distribution (GRASPED) Space Technology and Applications Mastery, Innovation and Advancement (STAMINA4Space Program) and National Telecommunications Commission (NTC) Fixed and Mobile Broadband Measurement Project. 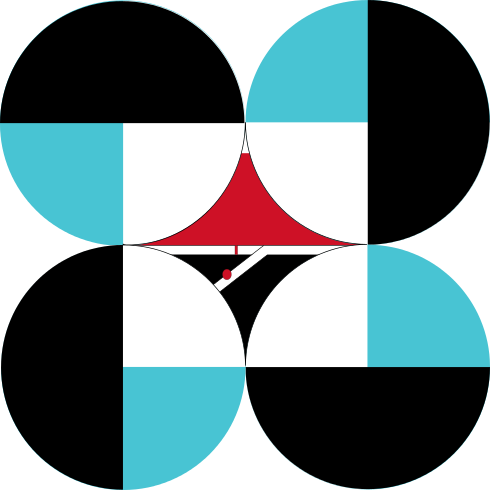 With the comeback of Engineer Joven C. Javier (one of MAYA-1’s developer) and Engineer Gerwin P. Guba (one of DIWATA-2’s developer), SSED also planned in contributing to the establishment of the Philippine Space Agency. Mrs. Joanna G. Syjuco, Computer Software Division Chief, discusses the projects completed by the division on 2018. 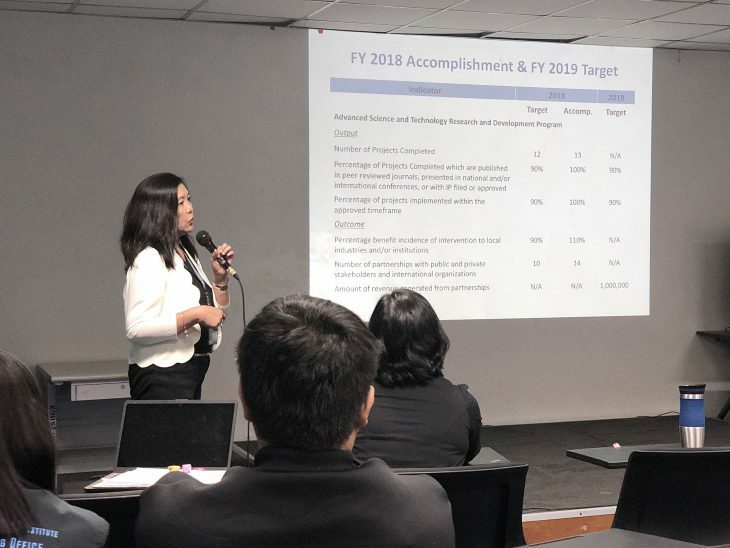 Computer Software Division (CSD) Chief Joanna G. Syjuco discussed the six major R&D projects handled by the division in 2018, and these were: 1) Housing and Urban Development Coordinating Council – Development of Housing Beneficiary Monitoring and Evaluation System (HUDCC-HBMES); 2) Development of the Department of Energy-Online System for Energy Collaboration and Cooperation (DOE-OSECC); 3) DOE – Critical Energy Installation Information System (DOE-CEISS) Phase 3 and DOE – Legal Services Information System (DOE-LSIS); 4) Development of Philippine Indigenous Instruments Sounds and Database; 5) Deep Learning and Natural Language Processing Approach to Predicting Case Decision in the Supreme Court of the Philippines (AI + Law: Deep Learning); and 6) Project ASTI Labeling Machine (ALaM) Phase 2 with Balik Scientist awardee Dr. Jose Ildefonso U. Rubrico. Three of these R&D projects (i.e. 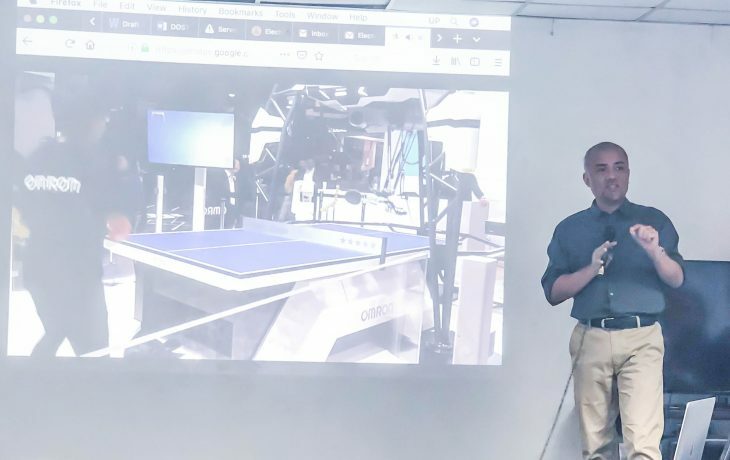 DOE-OSECC, Project ALaM Phase 2, AI+Law: Deep Learning) were already completed by the end of 2018. The three remaining R&D projects, along with the two new ones—Gul.ai: AI and Internet of Things-assisted Microfarming and the Development of Intelligent Data Analysis System (IDAS)—would be the focus of CSD in 2019. (From left to right: KMD Chief Rene C. Mendoza, KM Analyst Mitz Ann N. Montañez, Awardee Elmer C. Peramo, DOST-ASTI Acting Director Dr. Joel Joseph S. Marciano Jr.) The KM Unit awarded certificates of recognition to the employee and division with the most number of KSharing conducted as well as to the employee with the highest number of KSharing attended. One of the most notable accomplishments of the division and the agency in 2018 was the successful transition from ISO 9001:2008 to ISO 9001:2015 certification. This was made possible due to the consistent efforts of the division’s Knowledge Management (KM) Unit and the participation of process owners. In the same year, the KM Unit was also able to increase the number of KM activities (i.e. KSharing, after-action reviews) and provide support to agency events like the livestreaming of DIWATA-2 launch and the Domain Name System Security Extension (DNSSEC) training. Meanwhile, the Management Information System (MIS) Unit rolled out three R&D projects last year—Enterprise Resource Planning (ERP) Procurement System, Programs and Projects Database, and Test Automation Environment. They also handled the Domain Name System (DNS) administration for all government agencies, and improved the DOST-ASTI official website with the help of in-house graphic designers. This 2019, Mr. Mendoza was aiming to complete the ERP Procurement System, continue all Tech Support Team and the KM Unit activities, transfer the DNS administration to the Department of Information and Communications Technology (DICT), and improve the Quality Management System of the agency. Finance and Administrative Division Chief May C. Cayaban shares the accomplishments of her division in 2018. 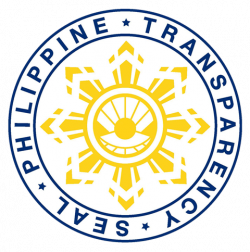 According to Finance and Administrative Division (FAD) Chief May C. Cayaban, the figures related to the agency’s budget in 2018 was a big improvement from 2017. Still, she believed that these percentages can be improved since the division was yet to achieve the 100% goal in budget obligations and disbursements. She then reminded all staff about the basic processes that could potentially improve the division’s operations and performance. 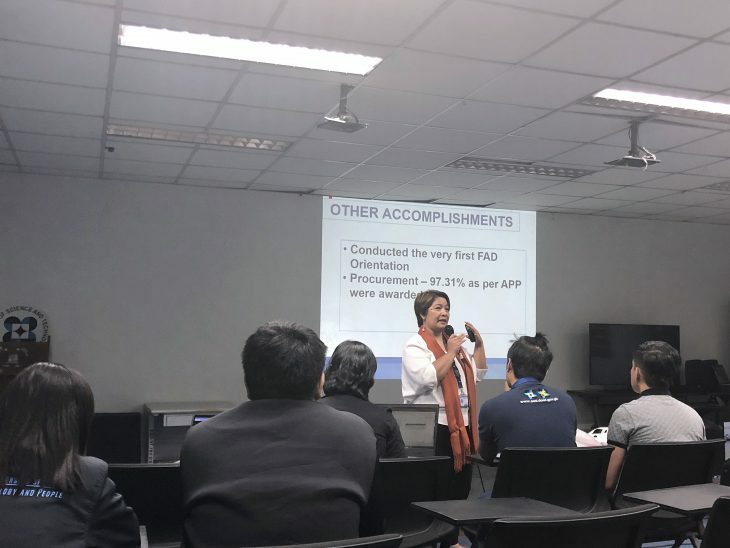 This 2019, Mrs. Cayaban was planning to conduct another orientation on FAD processes as well as efficiently conduct budget review regularly and procurement preparations. 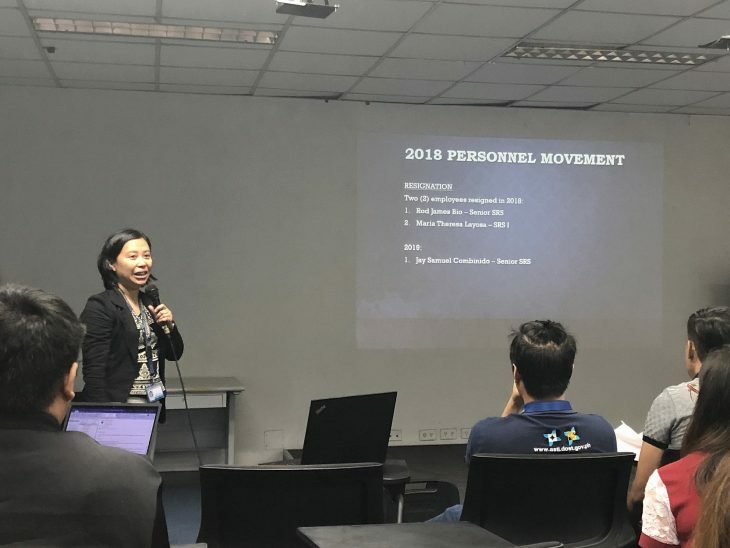 Ms. Mylene N. Monton, Human Resource Officer, discusses the personnel movement during the last quarter of 2018 and January 2019. Human Resource (HR) Officer Mylene N. Monton started her presentation by congratulating all staff with new appointments. She then proceeded in discussing other personnel movement matters, which included the total number of staff in the agency against the requested number and the ratio of technical staff to administrative staff. Ms. Monton also talked about HR development, wherein she encouraged regular staff to avail scholarships and trainings that could improve their work performance and help in their chosen career path. She announced that they have scheduled a KSharing about availing postgraduate scholarships on 30 January 2019. For 2019, the agency signed its second contract for the outsourcing of staff. Mr. Vhander T. Ramos of the IPM group discusses the intellectual property lifecycle and how it fits in the process of project development and approval. 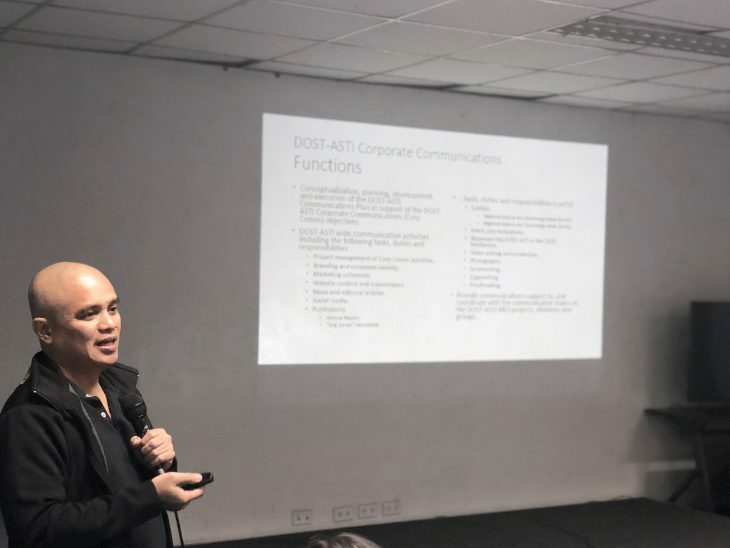 For the longest time, both the Corporate Communication (Corp Comm) Team and Technology Licensing Office (TLO) of DOST-ASTI were ad hoc committees. As such, the management decided to officially establish the TLO in 2018 to manage the agency’s intellectual properties and assist on technology transfer and commercialization activities. It was comprised of the Intellectual Property Management (IPM) group and the Technology Transfer and Business Development (TTBD) group. In less than a year, the TLO successfully renewed three industrial designs, registered nine copyrights, conducted two in-house trainings, and sourced five potential technology licenses. For 2019, the IPM group aims to increase the number of quality IP filings produced, increase employees’ awareness on IP, and enhance the unit’s capacity. Meanwhile, the TTBD group intends to increase promotion of IPs or technologies ready for commercialization, continue implementing IP to IP assets, and undertake more technology licensing and commercialization negotiations. Mr. Pedrito B. Mangahas, presents the functions of the Corporate Communications Team in the January Kapihan. On the other hand, the new Corp Comm Team was recently formed and announced this 2019. Mr. Pedrito B. Mangahas, Corp Comm Head, shared plans of drafting a communication plan for DOST-ASTI branding to improve content production for publications, social media, and marketing collaterals. Other activities to be handled by the Corp Comm included the National Science and Technology Week (NSTW), Regional Science and Technology Week (RSTW), as well as communications support to agency events. Ms. Maria Irene S. Amatorio, TTBD group head, shares her insights on the experience she had on attending a conference related to Intellectual Property. 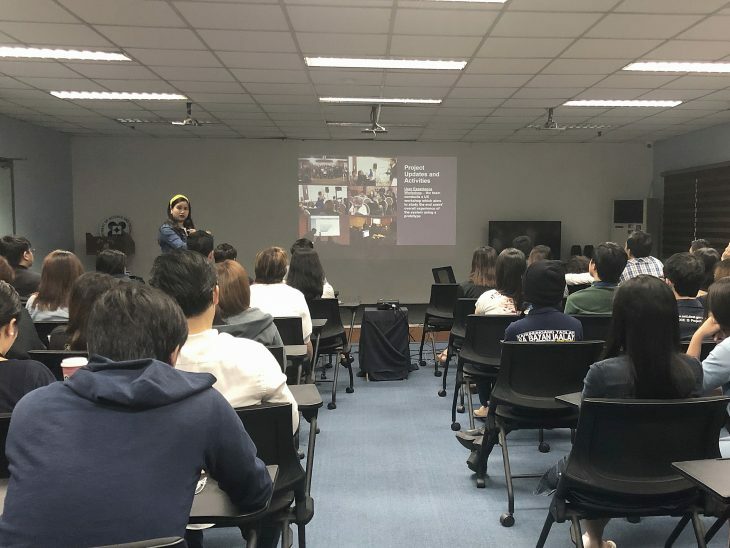 Ms. Maria Irene S. Amatorio conducted a KSharing on the recent Intellectual Property Rights conference she attended which was hosted by the Korea International Cooperation Agency (KOICA). Mainly, she discussed the importance of considering intellectual property (IP) rights in the R&D project proposal development and approval process. She also encouraged more staff, especially women, to file patents, utility models, copyrights and the like. Ms. Narcisa Juvilyn C. Castañeda of the Planning Unit projects the 2018 accomplishments and the 2019 targets. On the other hand, Ms. Narcisa Juvilyn C. Castañeda shared the overall R&D project updates for 2018. From the initial target of completing at least 12 R&D projects, the DOST-ASTI was able to complete 13 R&D projects. All of these were finished within the scheduled time frame. Dr. Joel Joseph S. Marciano Jr. addresses the DOST-ASTI staff during the January Kapihan. “2019 is a year to dream big for [DOST] ASTI…This is a good year. We are starting off on the right foot”, Dr. Marciano said. With all the accomplishments presented by each division, Dr. Marciano believed that the agency was in the right direction. He believed that the establishment of new units, particularly the TLO, would push government agencies and other institutions to seek the technologies and services provided by the agency. Aside from addressing the staff, Dr. Marciano also shared some insights on the latest technologies he encountered in the conferences he attended. For the last part of the Kapihan, the HR introduced the new staff to the agency and greeted the birthday celebrants.